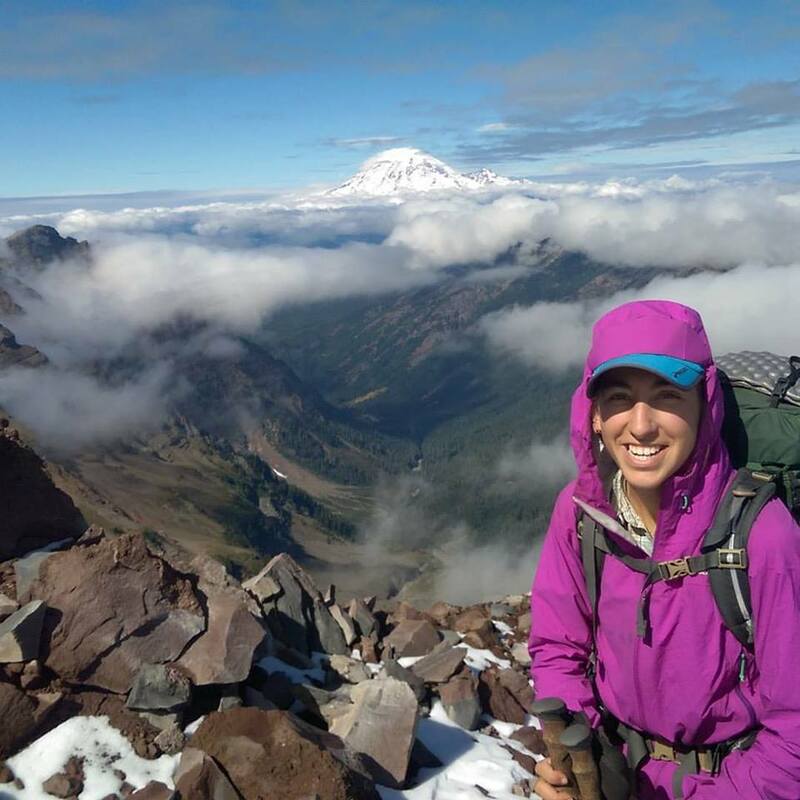 Jaala Freeman: Backpacking Guru | Great Outdoor Provision Co.
Jaala Freeman on the Pacific Crest Trail, specifically on the Knife Edge in the Goat Rocks Wilderness in Washington. One day Jaala Freeman was a runner with little outdoor experience. 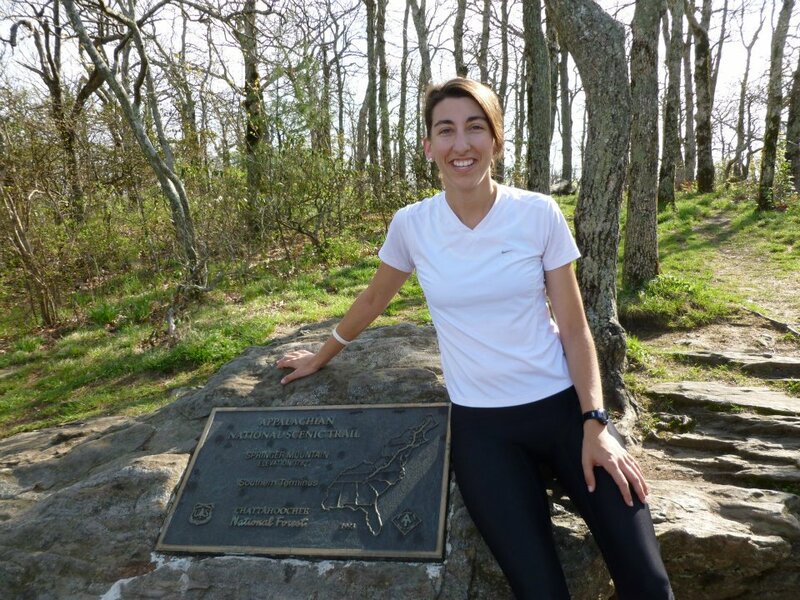 The next, almost literally, she was thru-hiking the Appalachian Trail. Jaala brings to our Cameron Village store a type of expertise, experience and encouragement that is priceless. Though active and athletic as a kid growing up in Conway, Arkansas, she wasn’t particularly outdoorsy. “My family went camping maybe twice,” she recalls. 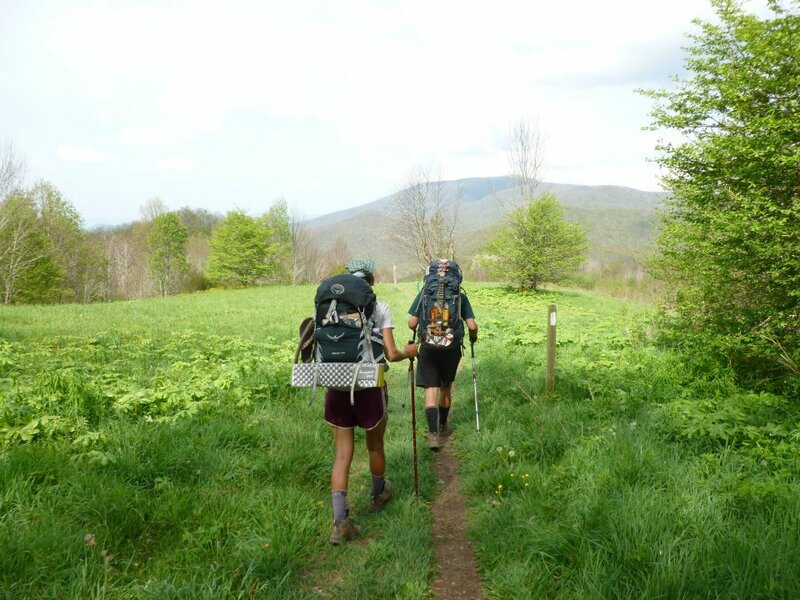 Then, when she was 25, a friend told her about the Appalachian Trail, and she was off. She did her research through local outfitters and trail blogs beforehand; her lessons continued on the trail. She finished her thru-hike of the AT and followed it with a thru-hike of the Pacific Crest Trail. Along the way, she learned a lot about gear, but she also learned about what motivates a person in the backcountry. Having a backpack fitted for you by Jaala is an examination not just of Pack A vs. Pack B, but of your motivations, your desire, your intent. Backpackers leave a “Jaala session” with more than the right pack, they leave with a good vibe for their coming adventures. 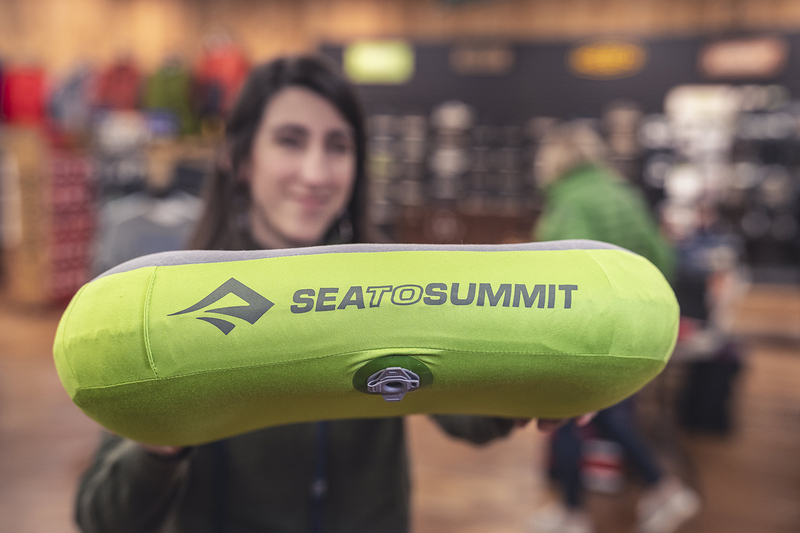 We spent a few minutes with Jaala recently to learn more about her thru-hiking experience and how that translates to helping customers. Jaala at the trailhead for one of her first hikes — the start of her thru hike on the AT. Q. When did you get introduced to the outdoors, and when did you become addicted to it? When I decided to thru-hike the Appalachian Trail in 2012. Q. That was your introduction? My family didn’t do much outdoors — we car camped a couple times when I was young. I ran track and cross-country in high school and college (Rhodes College in Memphis). I was sporty, but not really outdoorsy. When I was living in Fort Worth, I had a friend who mentioned that he wanted to hike the Appalachian Trail. I hadn’t heard of the trail, but the more he talked the more interesting it sounded. He sounded like he knew what he was doing. But the more I researched on my own, the more I realized he didn’t really know that much. I ended up taking a Greyhound to Georgia and starting my thru-hike as a solo hiker just 3 months after hearing about the trail. Chatty Kathy (a k a Tommy Freeman) a friend Jaala met on Day One of her AT thru-hike, proposes on the last day, atop Mount Katahdin. Q. You just chucked everything and left? The timing was good. I’d left my job of several years that fall and was doing serving. Plus, I’d gone through a period of decluttering where, for about a year and a half, every time I looked up I’d ask myself, “Why do I have this?” Every couple of months I was taking a trip to donate my things. Q. So the AT was indoctrination by fire? I did a lot of research beforehand, and there was a good trail shop in Arlington (between Fort Worth and Dallas) called Mountain Sports that helped me get geared up. But yes, you learn a lot just being on trail. I started with a 40-pound pack, but when I got to Neels Gap, Georgia (home to Mountain Crossings, which specializes in helping backpackers lose weight), they helped me trim down quite a bit. For instance, I had started out carrying seven days of food, when I only needed to carry three. The hiker who helped me trim down was named “Worldwide.” He had hiked the AT and the PCT, and was planning his hike of the Continental Divide Trail. He’s now a triple crowner, so he was a tremendous help to me. Woo hoo! 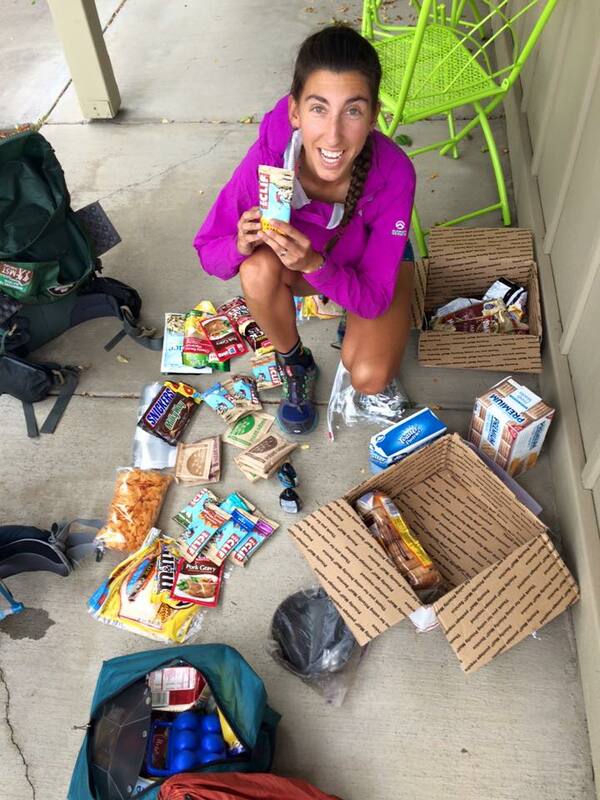 Food drop on the PCT! Q. 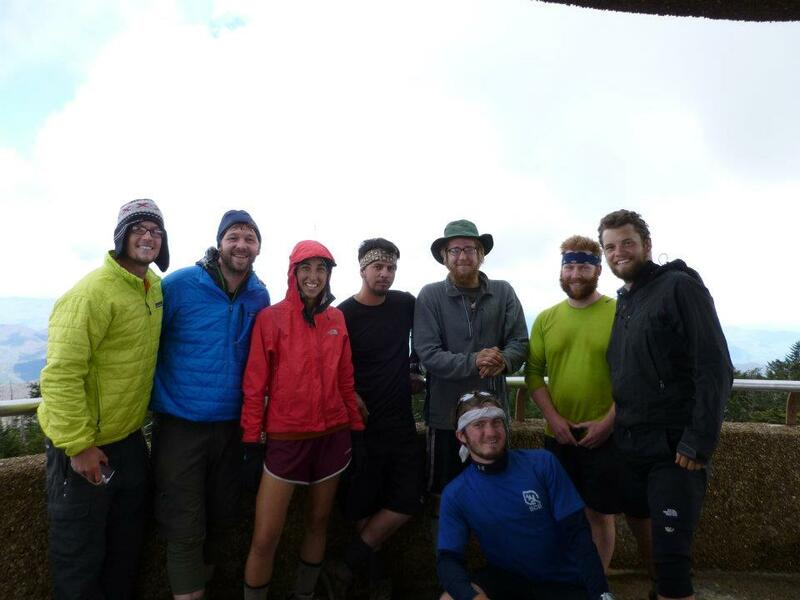 We hear about friendships being forged those first few days on the trail. Did that happen to you? I made lifelong friends on trail. In fact, I met the man I’m now married to, Tommy Freeman, on my day 7. I had crossed the GA-NC state line and came to a shelter at nightfall. There were some people being rowdy up at the shelter, so I set up my tent down by the creek. I woke up the next morning to someone yelling about pancakes! Just a mile north on the trail was the NOC, where you can get a hot breakfast. I thought the guy yelling was obnoxious, but I camped the next night with the same group, Shine, Birdman, Chatty Kathy and several others. We all continued hiking together for a while. Chatty Kathy (a.k.a. Tommy Freeman) and I had our first date at Dunkin’ Donuts in Gatlinburg, Tennessee. We ended up hiking the rest of the AT together. 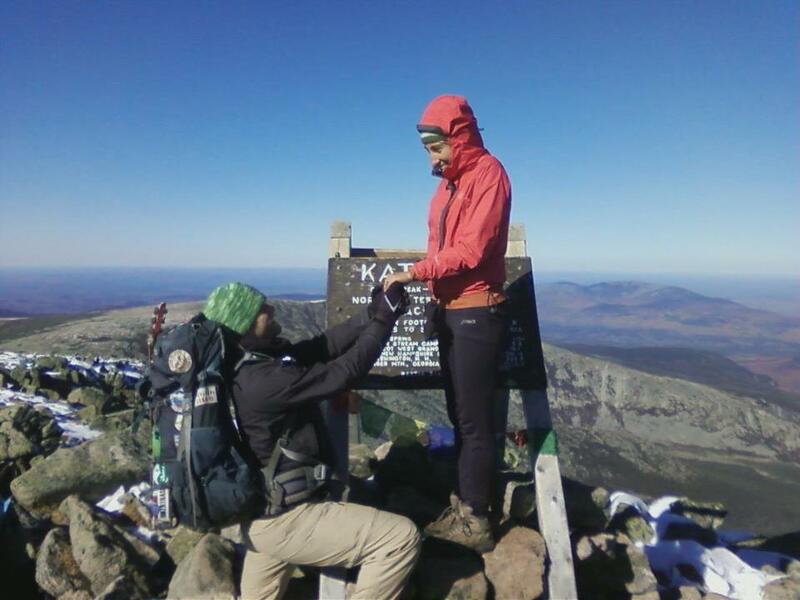 He proposed to me on Katahdin just after we touched the sign at the top. Q. And your trail name? Tommy and Jaala at the start of the PCT. Four years. After the AT, being engaged, Chatty and I came to Raleigh. He’s from here and I moved here. 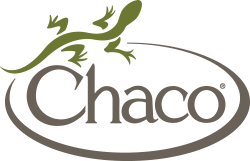 He hiked the AT as a fundraiser for Learning Together, a preschool for kids of all developmental abilities. Great Outdoor Provision sponsored him, so I became familiar with the Raleigh shop I started thinking about what I wanted to do. I was at Trail Days in Damascus, Virginia, in May 2013 and was talking to the Black Diamond rep. I asked how I could get into the industry, he said, “Get a job with a local mom & pop.” When I told him I was living in Raleigh, he said, “Great Outdoor Provision.” I started working here in July. Q. 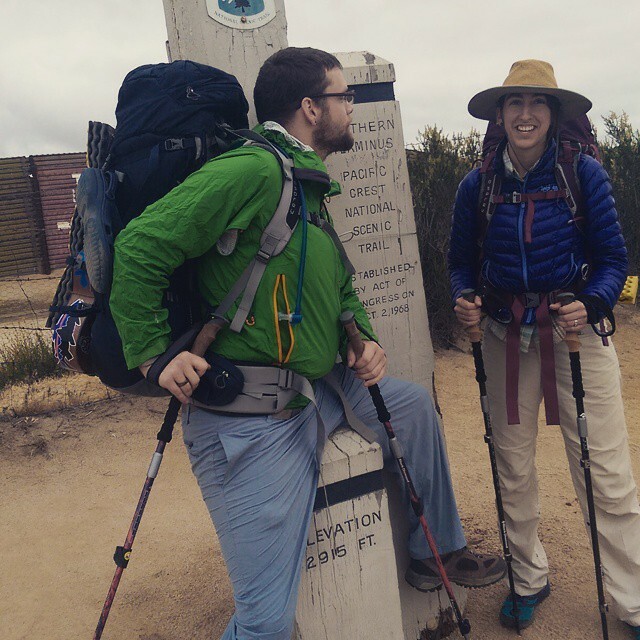 When and why did you do the Pacific Crest Trail (PCT)? I thru-hiked the PCT in 2015 with Tommy. It was our honeymoon. 2,667 miles from Mexico to Canada. Q. How do the AT and PCT compare? The PCT is more mentally challenging. With the AT (about 2,200 miles) you have a six-month window to hike it. The PCT is about 500 miles longer, but because of weather you’ve only got a five-month window. So you have to be more about the “business” of hiking and really put in the miles. On average, 17-18 miles a day on the AT compared to 20-25 per day on the PCT. The AT is also a more social trail. There are more people hiking the AT and the pace is a little easier, so people are more inclined to stop and camp with each other, rather than put in just a few more miles. Q. You have a reputation in these parts for being the person to see for a good pack fit. Why is that? I’ve had a lot of backpacks and fitted a lot of different types of people for different adventures. I went through four packs on the AT. The first one felt fine in the store, but after I’d been on the trail awhile I knew it wasn’t a good match. After about 1,000 miles, I got a new pack. That one lasted a few hundred miles, and I replaced that with a pack that I barely used. That was in Massachusetts. I happened to check a hiker box [where hikers drop gear they no longer need or want] and inside was a women’s Granite Gear Nimbus Ki. I finished with that pack. I made the mistake of switching packs when I did the PCT. At about the 350-mile mark, I called Great Outdoor and they contacted Granite Gear, who overnighted a Nimbus Trace Access Ki to me. That pack worked great! With about 500 miles left on the PCT, I’d lost weight and my hip belt no longer fit. I just couldn’t cinch it tight enough. I was at the PCT Days in Cascade Locks, Oregon, and stopped at the Granite Gear tent to see if they might have a smaller belt. They didn’t — so they had a smaller belt custom made for me and sent it to me on trail, just three days later. So, through experience, I know how important a good fit is. Jaala and her AT hiking crew, on Clingman’s Dome. Q. What’s your process for getting someone properly fit in a backpack? First, I find out what it is they plan to do with the pack. Are they doing day trips? Multi-day trips? That helps me figure out how much volume they’ll need and how much weight carrying capacity. A lot of beginners tell you they plan to carry about 25 pounds. They tend to underestimate: in reality, they’ll probably be starting at 40 to 45 pounds for a 3-4 day trip. We’ll work on getting a good fit with the pack stuffed, then we’ll throw in the weight, usually 30 to 35 pounds. That’s often a shocker. Then we show them what all the straps do, so they feel prepared to make small adjustments on when they’re in the field. I simply walk customers through all the options and they decide what works best for their needs. Q. Your favorite piece of equipment? My Western Mountaineering 20-degree sleeping bag. It’s the lightest, warmest, most compressible sleeping bag. I’ve never had a bad night sleep in that bag. I love working with backpackers and world travelers! But I also love working with the woman who comes with three kids, pushing a stroller, looking for clothes. 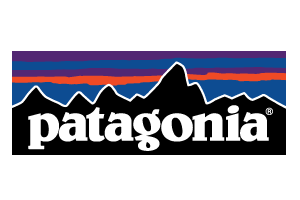 I think it’s awesome that so many people look to the outdoor industry for everyday clothes. And I love it when people bring in photos of where they’ve been and what they’ve been up to. Q. The AT, the PCT — any interest in the triple crown, by adding the Continental Divide Trail to your resume? Not really. If we did that it would be just to say that we did it. What we have thought about is the Grand Italian Trail, which runs the length of Italy. Q. Any parting advice you’d like to share based on your thru-hiking experience? When I was hiking in the White Mountains, on the AT, I ran into day hikers who would ask, “Are you going to make it?” I was a little offended, but then I realized I had crossed a threshold, It was no longer a question of “if.” At that point I knew that my body could do whatever it took. If I needed to hike 30 miles a day to finish, I could hike 30 miles a day. The same thing happened on the PCT. I would also encourage anyone, but especially women, to try a thru-hike. Don’t hold back — go ahead and do it. I love that Tommy likes to do the long hikes with me, but I would do them anyway. It’s a privilege to share all those experiences with him, but he’s not the reason I’m out there. I would encourage everyone to find their own reason why they love to be in the outdoors.